The 1971 AMC AMX was as complete redesign of the previous three model years. In fact, the well known two seater sports coupe was now gone. In replacement was the Javelin AMX which was a much larger, heavier, and roomy sports cruiser that could haul four people. For some die hard AMC fans the new AMX seemed a bloated mistake. 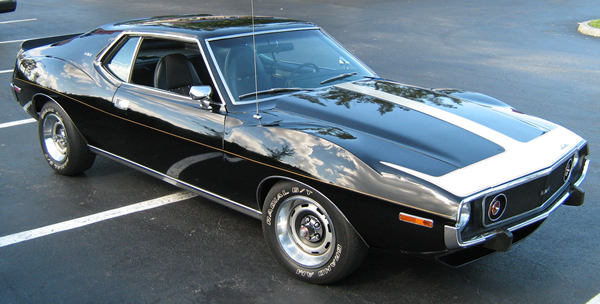 In fact, the AMX was simply an add on package to the new AMC Javelin. 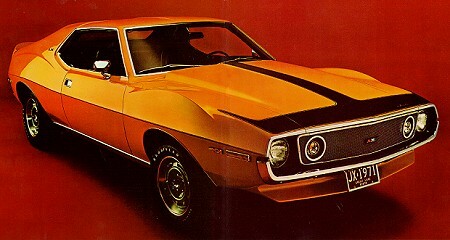 The buying public seemed to show their lack of interest in muscle cars like the AMX as sales plummeted again this year. The final model year would be 1972. The body style featured a long and wide body which profiled huge curves over each wheel well. The AMX version of the Javelin featured its own grill and front and rear spoilers. Gone was the ram air system. However, an optional cowl induction system became available for those looking to squeeze every extra horsepower from their AMX. The “Go” package was still available and included a T stripe decal over the hood, Rally Pac instruments, special handling package, heavy duty cooling, Twin-Grip differential, front disc brakes, Goodyear E60×15 Polyglas raised white-letter tires, and slotted styled steel wheels (the same ones used on the 1970 Rebel Machine). The major news for AMC this year was the introduction of a new motor - the 401 cubic inch V8. This was essentially a bored and stroked version of the 290/390 motors. Performance with the 401 was acceptable by 1971 standards and pushed the AMX to mid 14 second quarter mile times. Although the AMX name would be used by American Motors for the next twelve years, 1971 was truly the final performance year for the AMX. Subtle body style changes would evolve during the 1971-1974 production run. However, power output would drop significantly before the Javelin was dropped totally. * Front tread for Sixes 59.3", V-8's 59.7"
* Trunk space 10.2 cu. ft.
* Brake diameter, Sixes 9", V-8s 10"
* High-level ventilation system with opt. air cond. * High-intensity headlights with "Guard-Glo"